Grind green chillies and mint leaves. Heat ghee in a pan and fry cashewnuts. Now add bayleaves, cinnamon sticks, onion. When the onion turns translucent, add ground green chilli and mint paste, ginger garlic paste, and chilli powder. Saute for 5 minutes. Now add cooked rice and salt to this and mix well. Add lemon juice just before serving. Wash and clean Basmati rice. Drain water. Chop carrots and beans. Cook cleaned prawns with salt and soya sauce. 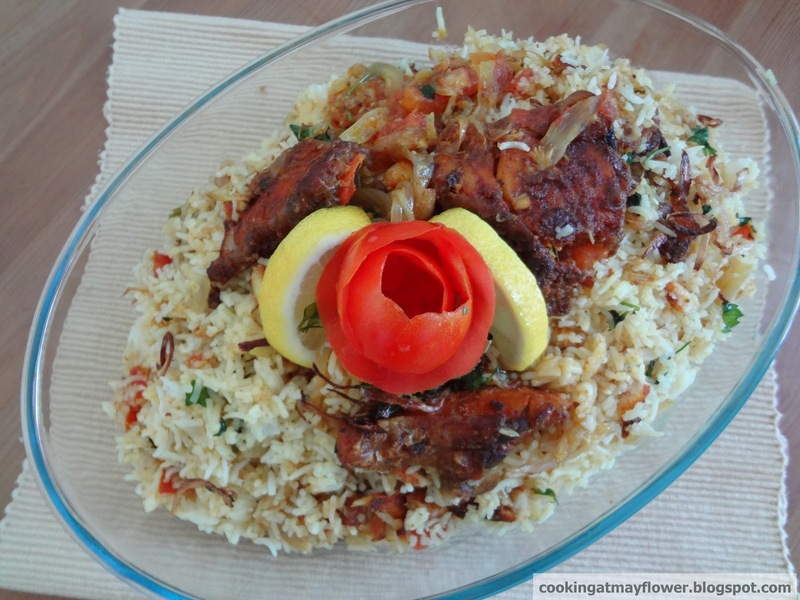 Cook basmati rice along with cinnamon, cloves, cardamom, fennel seeds and salt. heat oil in a pan. Saute garlic and onion. add green peas, chopped vegetables. Now add cooked prawns. Now add cooked rice and salt. Stir well. Close the lid for 5 minutes and cook. Turn off the stove and serve the rice decorated with coriander leaves. Serve hot with any spicy curry. Soak tamarind in water and extract a thick juice to not more than 2 cups . Fry and powder the ingredients as above. Mix sesame oil and powder to the cooked rice. Heat sesame oil in a pan. Add mustard seeds, chana dal, asafoetida, red chilli, peanuts, curry leaves and fry for 2 minutes. Now add tamarind extract, turmeric powder, and salt. Boil this. 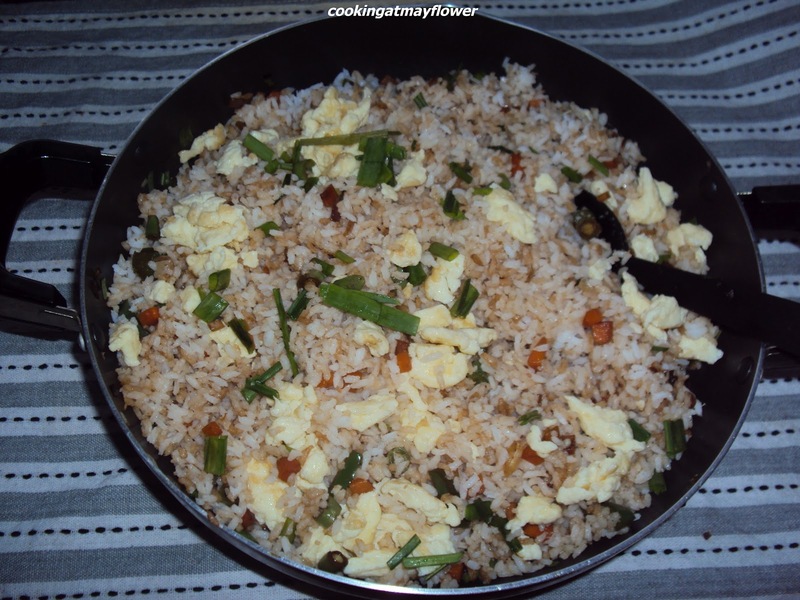 once boiled, add cooked rice mixed with sesame oil and powder. Yummy tamarind rice ready. 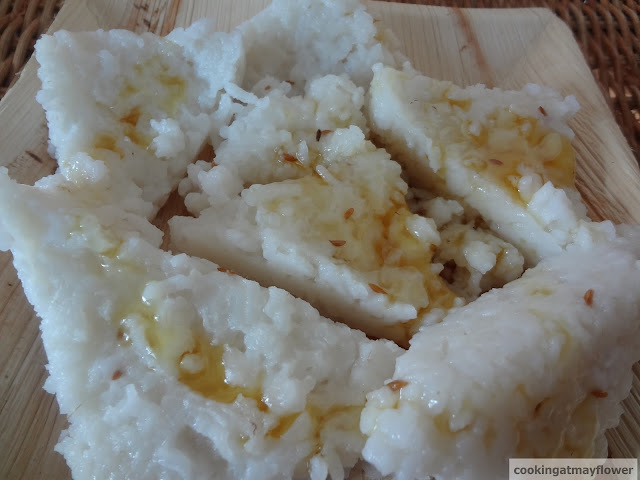 Optional - Add 2 tsp jaggery syrup and 2 tbsp powdered roasted coconut to enhance flavour. Wash and soak rice in plenty of water for 30 minutes. Heat ghee in a pressure cooker. Add bay leaves, black cardamom, cloves, cinnamon stick, and cumin seeds stir fry. Add soaked rice and cook for 10 seconds. Add 4 cups of water and salt to taste. Pressure cook till one whistle. 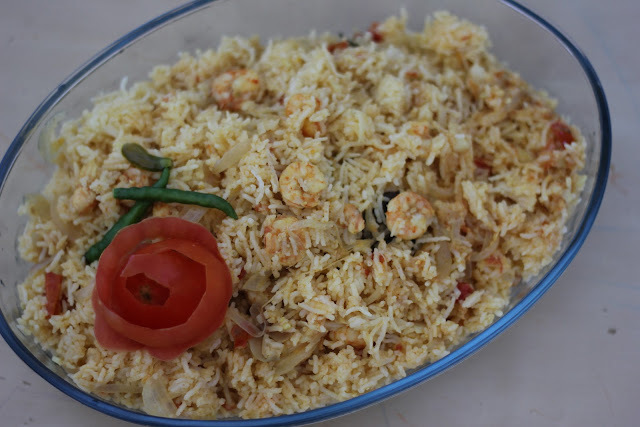 Wait for the pressure to release, then open the pressure cooker, fluff up the rice with a fork and transfer to a serving bowl. Sprinkle coriander leaves if you like. Serve jeera rice with Shahi paneer, vegetable korma, kadai paneer. Soak rice for 20 minutes . Drain the water completely and keep it aside. Heat oil in a pressure cooker, add bay leaves, cloves, cardamom and cinnamon. Saute for 30 seconds. Add rice and fry for a minute. Now add 4 cups of boiling water and salt . Close the lid and cook for 1 whistle . 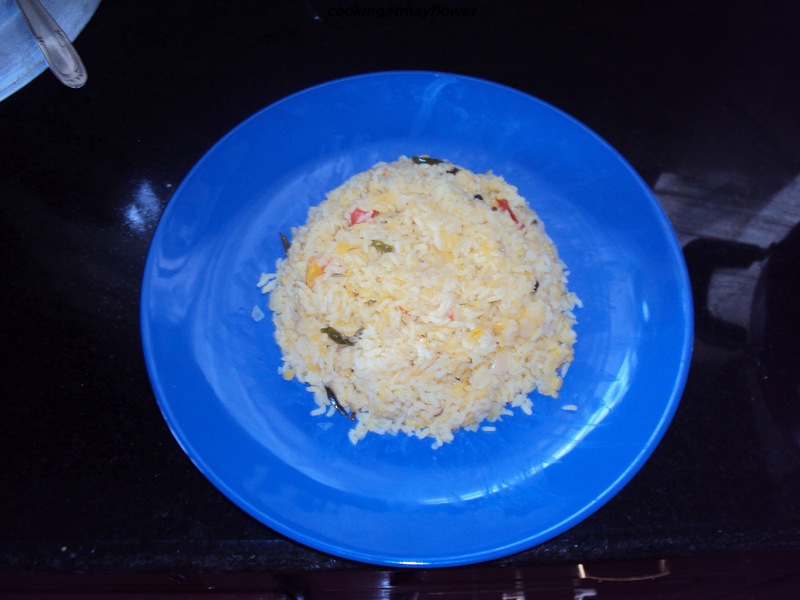 Open the pressure cooker after 10 minutes and spread the rice in thin layers so that lump does not form. Heat ghee/oil in a pan, saute onion. When onion turns brown in colour, add turmeric powder, chilli powder, and garam masala. Add tomato to this. When tomato is all mashed and oil starts to float on the surface, add mint leaves, coriander leaves, and salt. Mix well. Now add this to the cooked rice and mix well. 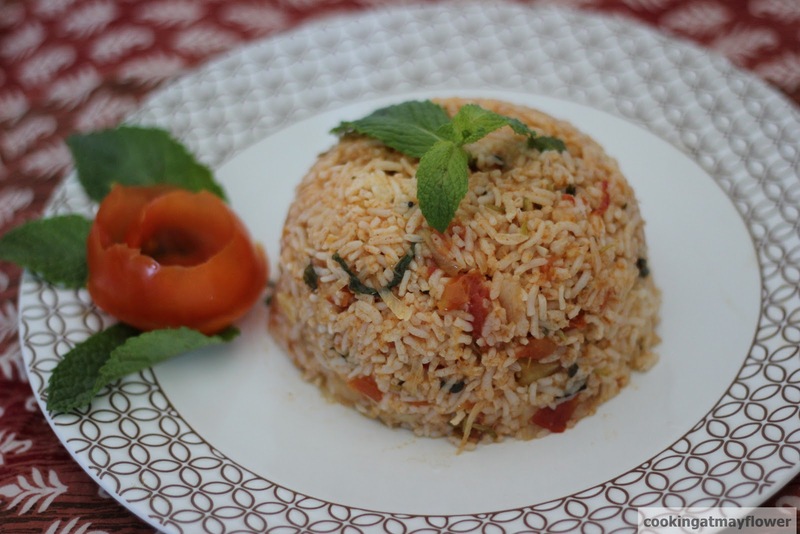 Tomato rice is ready to be served with raita. 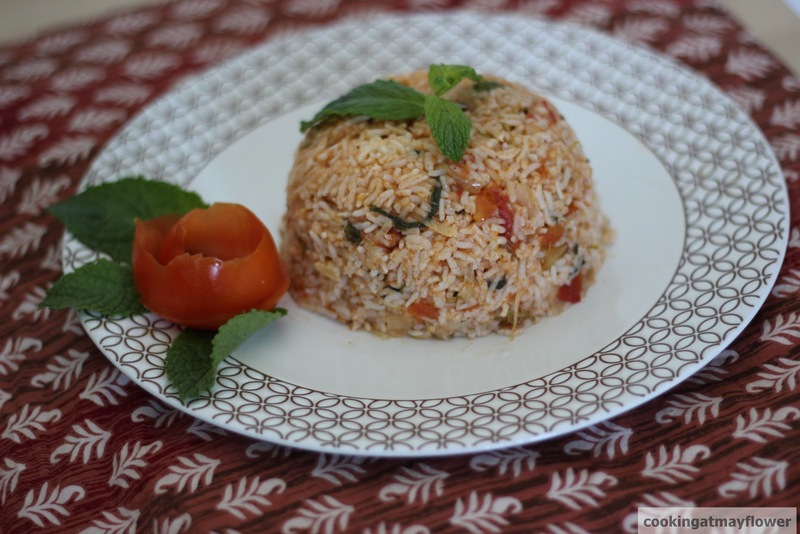 Garnish with chopped mint leaves and coriander leaves. Cook rice with 2 cups of water adding little salt. Beat the eggs with a pinch of salt and pepper. Heat oil in a pan, add the beaten egg. Stir it continuously to scramble it. Set this aside. Heat oil in a pan, add onion, garlic paste and ginger paste. Toss well for 5-6 minutes. Add chopped vegetables and fry for 3 minutes. Sprinkle little water and cook it covered for 3-4 minutes or till it is cooked. Saute till it is dry. Add soya sauce and mix well. Add cooked rice and mix well. Saute for 3 minutes. 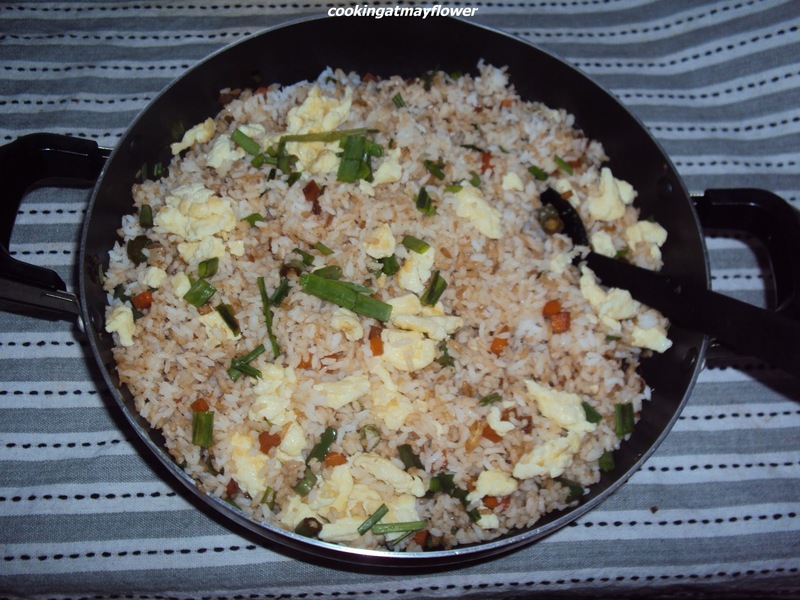 Add scrambled eggs, chopped spring onions, salt to taste, and pepper. Mix well. 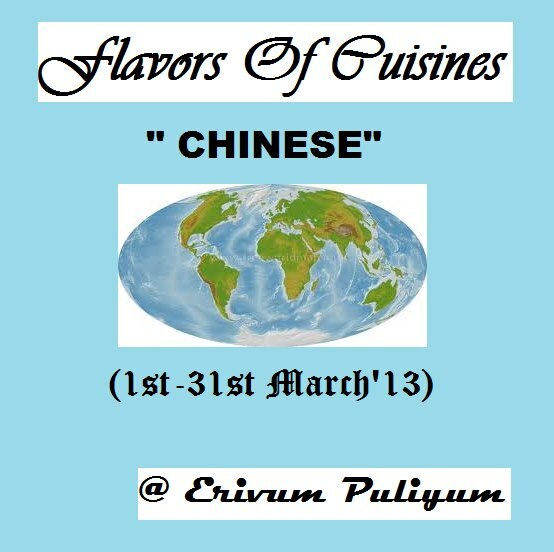 Serve hot with chilli chicken or gobi manchurian. Wash the rice and drain water. Heat oil in a pan, crackle third ingredients. 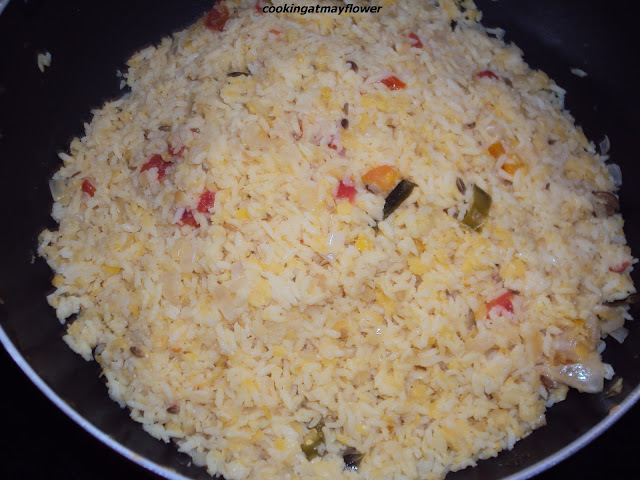 Add rice and saute for 5 minutes. Now add salt and hot water. Close the lid, lower the flame, and allow water to reduce. Heat oil in another pan, saute 2nd ingredients. When it is sauteed well, add prawns and salt. When the prawns are half cooked, add curd and cook for another 2 minutes. Reduce the water. 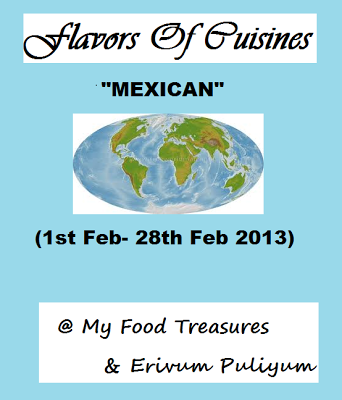 Mix this to the above cooked rice and serve hot. Pachoru is a traditional Christian delicacy. For Mother Mary's feast, Pachoru is served in church. This is one of the main offerings at many churches. Pressure cook raw rice along with 5 cups of thin coconut milk, salt and cumin seeds till 2 whistles. 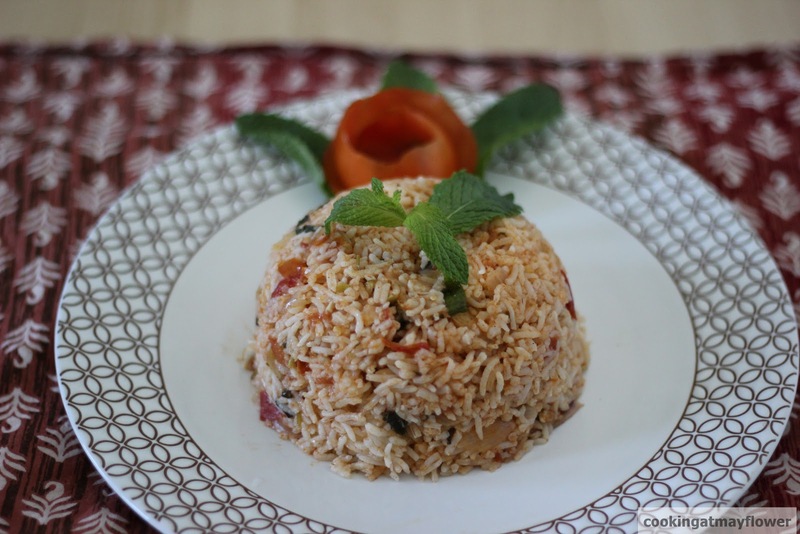 When the pressure is released, add thick coconut milk to the cooked rice. Boil it. Switch off the stove. 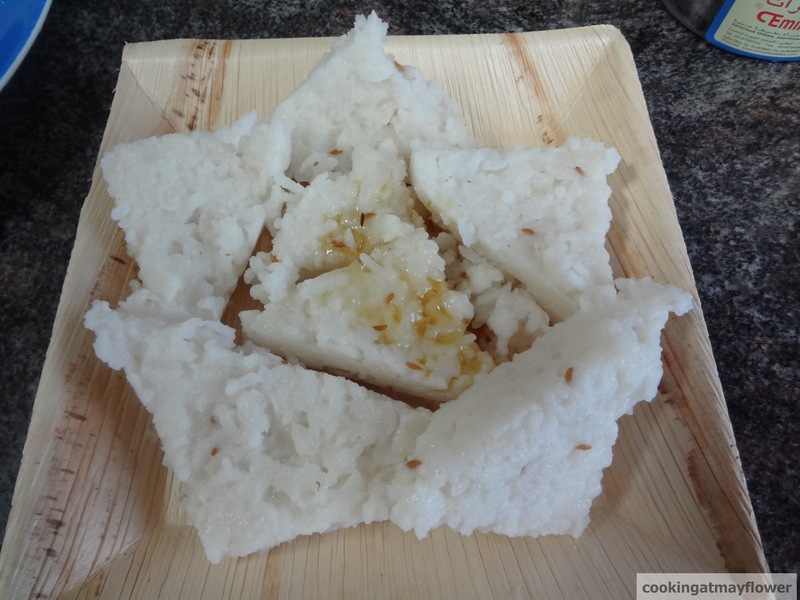 Grease a plate and pour the cooked rice to this and flatten it, keep it for sometime, so that you can cut it into the desired shapes. 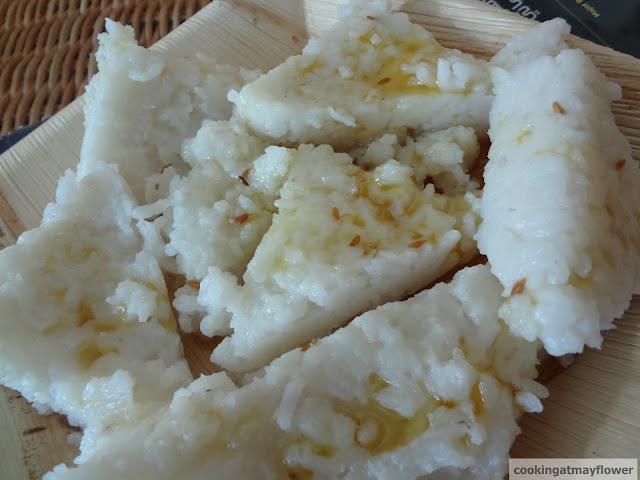 Pachoru is ready to be served with jaggery syrup or sugar. Add some water to the grated jaggery. Heat this. Let the jaggery dissolve and let it thicken slightly (don't overdo it). You can add ghee to this for taste. Jaggery syrup is ready to be poured over pachoru. Soak rice for one hour. Heat ghee in a pan, fry paneer pieces till golden brown and keep them aside. Saute 4th ingredients in remaining ghee. Drain the rice and saute for 2-3 minutes. Add peas and raisins and saute for another 2- 3 minutes. Now add salt, sugar, and water to this and boil in a low flame. When all the water is absorbed and rice is cooked, add fried paneer pieces to this and cook for another 5 minutes. Serve hot with raita and pickle. Cook basmati rice with 3 cups of water. Keep them aside. Heat oil in a pan, saute ginger, green chillies, and curry leaves. Add the cooked rice and then the curd. 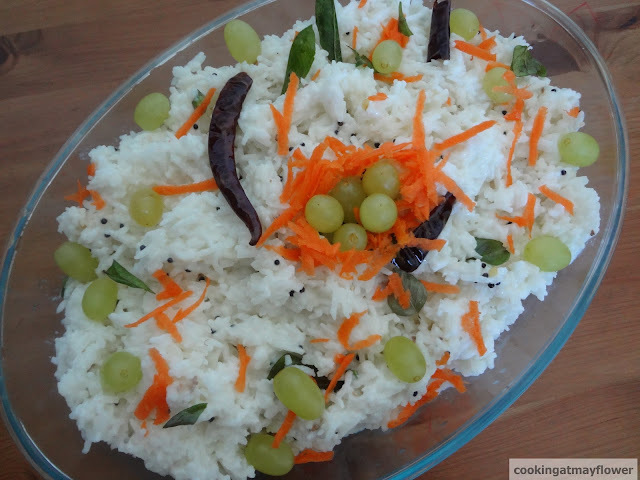 Let the heat pass through cooked rice and curd. Switch off the stove. 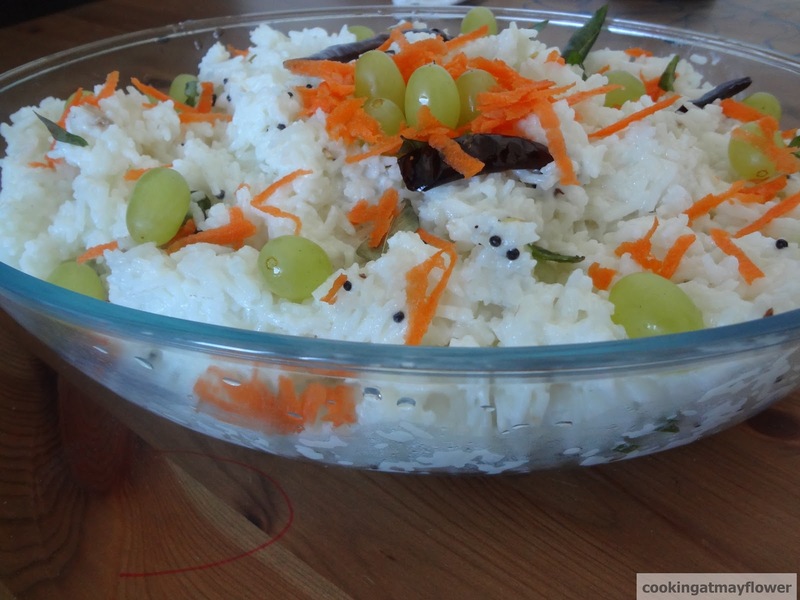 Decorate with grated carrots and grapes. Marinate fish pieces with salt, turmeric powder and chilli powder. Fry the fish pieces (don't fry then too much). In the remaining oil, saute onions with salt. Reserve 2 onions for later use. Now add green chillies, ginger, garlic and tomatoes and saute them for 2 minutes. After that add 1 cup of water and cook for 5 minutes. When all the masala is cooked well, add one piece of fish without bone (break them into pieces). Add half of garam masala powder, half of coriander leaves and salt. Place the fish pieces above the masala and cook till the gravy becomes thick. Heat ghee in a pan, add reserved onions and fry till brown in colour . Add the other half of garam masala powder and coriander leaves to it. and allow water to reduce. Layer half of the rice over fish masala. Now sprinkle lime juice over the layer. Now add half of the fried onions. Now layer again with remaining rice. Sprinkle some more lime juice. 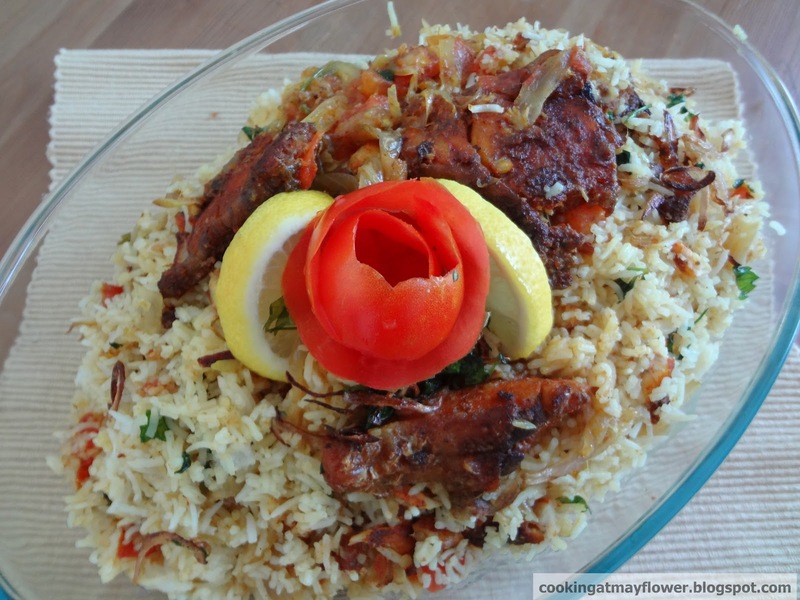 Close the lid and put this in dum (keep the biryani in low flame for 5 minutes). Decorate with fried onions, fried cashewnuts and raisins. Serve hot with raita, pickle, and pappad. Fry sausages and keep aside. In the remaining oil, saute onion and garlic. Then, add chilli powder and pepper powder and saute for a minute and add 31/2 cups of water, salt, basmati rice, cooked rajma, and tomato sauce. Close the lid till the rice starts getting cooked. At this point, add sausage and cook for 5 more minutes. Sending this to event - flavors of cuisines hosted by Janet of My food treasures and Erivum puliyum. Soak masoor dal and rice for 1 hour and drain well. Pour some oil in a pan, add 4th ingredients and saute well. Now add 5th ingredients and saute well for 1 minute.When onion turns light brown, add chopped tomato and saute well for minutes, add dal, rice, turmeric powder, salt and 3 1/2 cups of water. Close the lid and cook for 8-10 minutes on medium heat. Heat 1 tablespoon of oil in a pressure cooker. Reserve two sliced onions for later use. Saute rest of the onions along with salt. Now add 5th ingredients and tomato, sauté for 5 minutes. Add coriander powder, turmeric powder, salt and chicken pieces and cook. 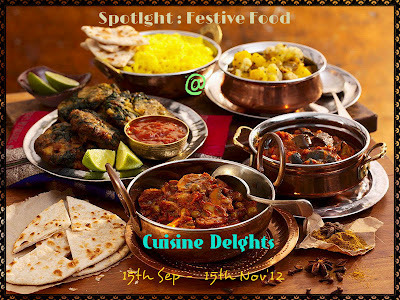 When it is cooked, add ½ garam masala powder, ½ coriander leaves, 1½ tablespoon lemon juice and mix well. Heat thick bottom vessel, add chicken pieces, ½ of the gravy from the pressure cooked chicken and reduce. Add rest of the lemon juice and ½ of the garam masala to the reserved chicken gravy. In a thick bottom vessel, add oil and ghee, brown the onions. Save this for later use. Now add basmati rice and fry. Add boiled water and when boiling well, add cardmom powder, mint leaves , and salt as needed. Slow the fire, stir occasionally. When the rice is ready add the chicken gravy to this. 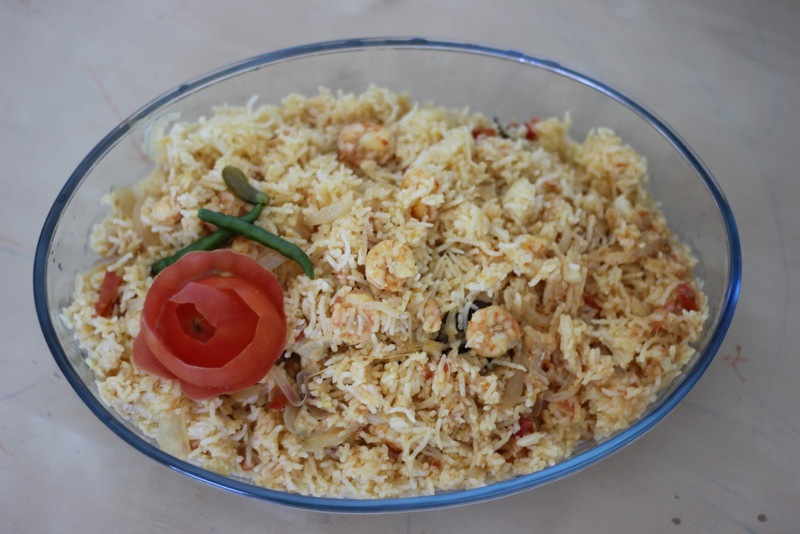 Layer the rice to the chicken masala prepared before. Layer browned onion, coriander leaves. Now add rest of the rice. Now close the vessel and put it in dum. 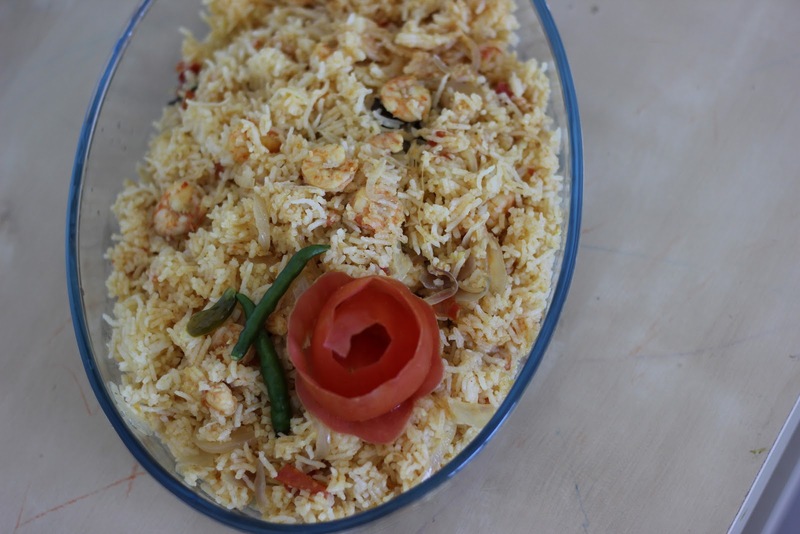 Chicken biriyani is ready to be served.